Affiliate+ members have access to in-depth, high-value, leading-edge content, organized by topic to address the most pressing facility design issues impacting health outcomes and healthcare costs. 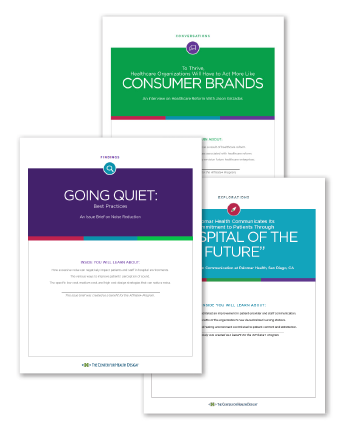 Take a look at four examples – a case study, an expert interview, a lessons learned summary, and a deep-dive issue brief – representing the quality and some of the types of content available exclusively to The Center’s Affiliate+ members. Organized by topic, each Toolbox contains a library of expert insights, case studies, research data, strategies and tools which can be shared and used by your entire organization. Complete and submit the short form below. Within a few moments you should receive an email from admin@healthdesign.org containing the download link. If you don’t receive this, check your spam or email that address for assistance.